Bob was very helpful in suggesting equipment he has found serviceable which students engage quickly with. He was responsive to feedback and suggestions from our students, staff & parents and worked with us to come up with the concept. The team from NT Surfacing were professional, respectful and at all times worked closely with our school community to ensure safety of our children during the construction phase. 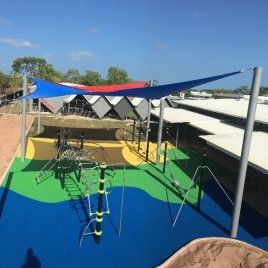 The final design developed by Bob was quickly endorsed by our community and the playground was finished in August 2016.